I recently published my guide for Christmas at Walt Disney World, but that shouldn’t be the end of your festive celebrations if you’re visiting the Orlando theme parks over the holidays! Universal Studios Orlando does a fantastic job of decorating their parks and adding some great Christmas shows and activities. Their holiday offerings typically start later than those at Walt Disney World, which go up as soon as Halloween is over; look for Universal’s decorations and shows to begin at the start of December and run through the New Year. Take a look at my list of some of the best things to do over Christmas at Universal Studios Orlando! I have always loved watching the Macy’s Thanksgiving Day Parade on TV, but the thought of traveling to New York City to camp out on the streets in the freezing cold with two young kids – well, it just doesn’t sound like much fun! 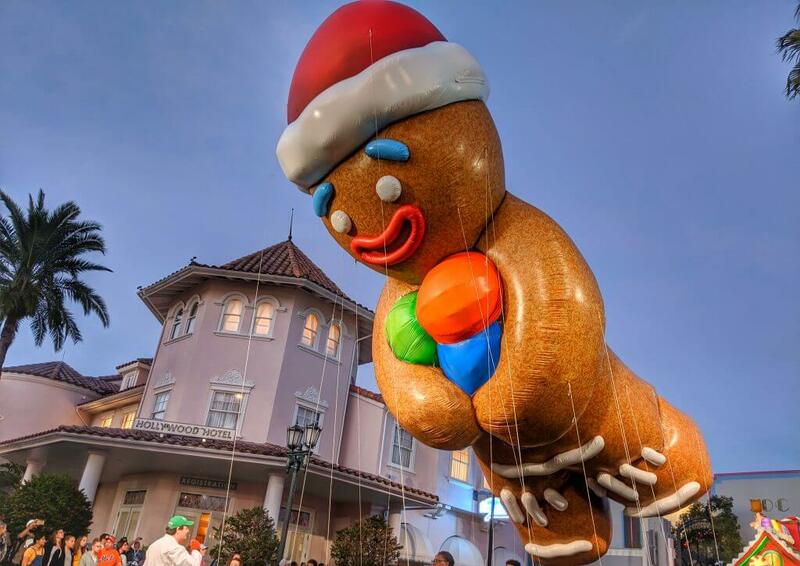 Luckily, once the balloons are done floating down the streets of New York City, some of them – along with some of the floats – are packed up and sent down to Florida, where they can be seen every day at Universal Studios Orlando. The parade runs through the Universal Studios park, with dancers, clowns, and of course, Santa in his sleigh! The parade is amazing, and seeing the giant balloons up close is super exciting! The balloons and floats arrive in Florida around the beginning of December, so if you’re visiting the parks in December, you should be in luck! Mannheim Steamroller are one of those bands that just gets my in the Christmas spirit every time I hear their music! 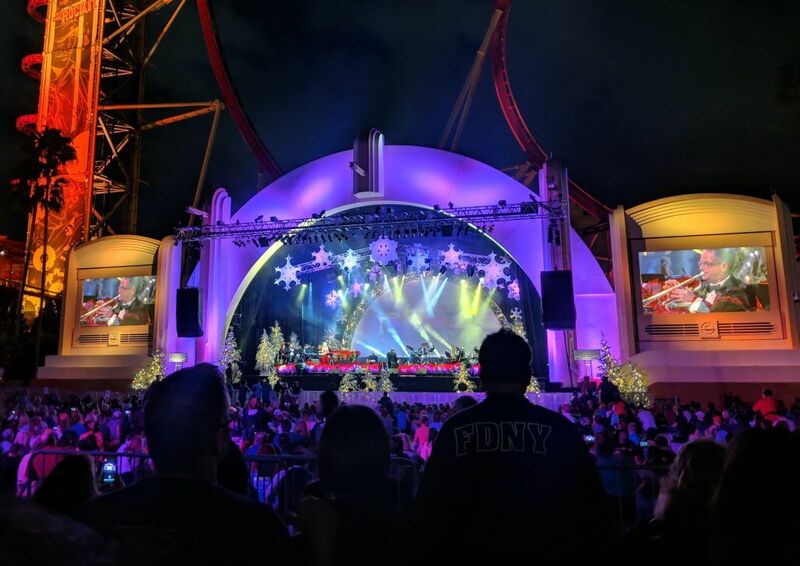 If you’re lucky enough to visit Universal Studios Orlando during December, you can catch one of their concerts live at Universal Studios Park. Like all concerts performed at Universal Studios, the seating is first come, first serve, and as to be expected, these concerts are very popular. I would recommend arriving at the Universal Music Plaza at least an hour or two before show time to be sure to get a good seat – although there is standing room available, and you should be able to find somewhere to stand up to about 30 minutes before the show begins. If it’s not enough to watch The Grinch perform his story, then perhaps you’d like to have breakfast with him! In the Circus McGurkus Cafe Stoo-pendous in Seuss Landing, you can dine on French toast, waffles, sausages, bacon – and of course, green eggs and ham! – with The Grinch and a host of other Dr. Seuss characters. The package also includes a souvenir photo with the Grinch, as well as other opportunities for photos and autographs with all of the characters present. This is a popular dining experience, and tickets must be reserved in advance, so be sure to book yours ahead of time! As well as all of the other festive activities, Universal Studios Park has two other Christmas shows to offer. The Blues Brothers Holiday show features holiday favorites such as ‘Santa Claus in coming to town’ and ‘Blue Christmas’, performed by Jake and Elwood in their regular spot, finishing up with snow! The show is a lot of fun, and the music is great! Also at Universal Studios Park is A Barney Holiday, which is a holiday version of his regular show back by Fievel’s Playground. If you’re at the park with young kids, this is a cute show. Both The Blues Brothers Holiday show and A Barney Holiday show multiple times a day, so check your park guide for times. New for 2017 was the Christmas celebration at The Wizarding World of Harry Potter, which turned out to be one of my favorite Christmas events at Universal Studios Orlando. Both Hogsmeade and Diagon Alley are trimmed with Christmas decorations, and holiday treats and merchandise are available. Best of all will be the brand new holiday show, with magic being used to cast a spell and project images onto Hogwarts castle. 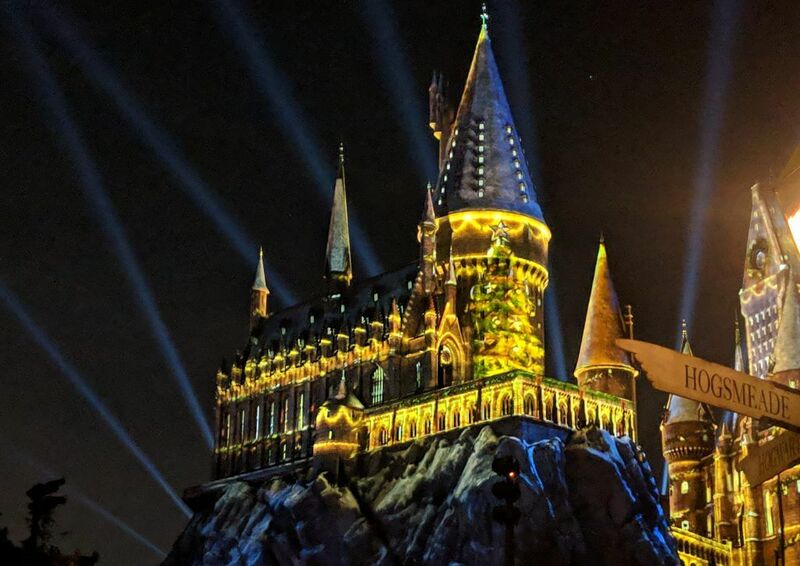 This was something Harry Potter fans begged for for years, and it absolutely did not disappoint; it really is the perfect setting for Christmas festivities and the atmosphere in Hogsmeade and Diagon Alley feels so special during the holidays. Have you visited Universal Studios Orlando during the holidays? What was your favorite thing to do? Let me know in the comments below! I love the grinch!! I would love to go this year…hopefully soon! I really thought my little one would be afraid of him after reading the story, but he gave him a hug and a big kiss and basically had to be pried away from him! When Seuss Landing is turned into Grinchmas, it really is cool to see!